“Our Farm”...it started with wanting tasty food. And wanting nutritious food. Food without chemical sprays and chemical fertilizers. Food that is non-GMO. Out of this “Our Farm” was born in the heart of the prairies in Saskatoon, Saskatchewan, Canada. Our Farm has Organic Certification - Certified by Pro-Cert Organic Systems.We went through this multi-year process of of inspections, production plans, records and tests so that you can rest assured that our veggies we grow for you are grown organically. 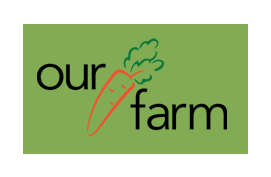 We want you to be confident that our veggies are healthy and safe and comply the the Canada Organic Regime.We strive to grow you tasty, nutritious, fresh, local, organic, non-GMO food. Food that has been grown with care for the environment in as sustainable ways as possible. With minimal packaging and energy use. Food that tastes great and is good for you. We looked around us and were seeing so much ill health. The more we studied, the stronger the link between what we eat and our good or bad health became to us. And the more we looked, we discovered how broken our food system is...it did not seem to be about good taste or good nutrition..it seems to be about what will survive trucking and storage for longer than food should be stored, or what will keep on the shelf the longest....what is good for the seller and not good for the consumer. Know what you are eating and how it was grown and if it is healthy for you! We hope that “Our Farm” will become your farm. Food that tastes great and is good for you. We grow our food locally just outside the city limits on a 2 acre parcel. Picked fresh and to your table quickly. No cross continent truck ride for our veggies! You won’t believe how good really fresh veggies can taste. Minimally packaged. Ethically grown. You can purchase our veggies by CSA Subscription, A La Carte on line, or at our farmer's market. Our location for Our Farmer's market for 2019 will be at St. Joseph's Church parking lot at Broadway Av. and 8th St. on Saturdays 8:00am to noon starting June 29th to Sept. 28th. CSA subscriptions and A La Carte orders can be picked up or delivered (there is a fee for delivery). Story of Your Food- Cucumbers = Pickles!